I spent this Halloween with my three-week old niece. It got me thinking about all childhood Halloweens. My mom used to make all my costumes — from Strawberry Shortcake (I won a prize!) to Snow White, my mom dutifully sewed whatever I asked. Thanks, mom! 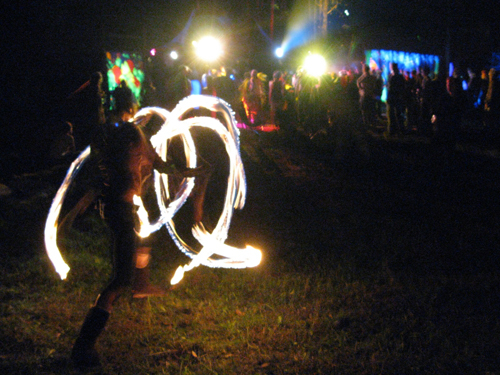 Here is a roundup of some of our writers' favorite Halloween memories. Please share your Halloween adventures with us in the comments below! Jeff Rose: It was November 2004. I was set to deploy to Iraq in January for a 15 month deployment. My original plan was to propose to my (now) wife in January, but the Army kind of interfered with that plan. Knowing I wanted to do it before I deployed, I was having a hard time trying to find the perfect opportunity. 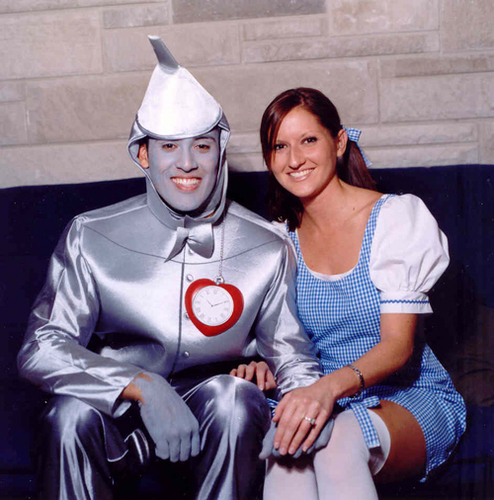 For Halloween that year, we had our costumes picked out: I, the Tin Man, and my wife, Dorothy. Me being me, I had to come up with something clever and romantic when I proposed. I had never been more nervous in my entire life. Getting down on one knee, I uttered something to the sort of, "You are my Dorothy. You will always and forever have my heart. Will you marry me?" Even as cheesy as that was, she still said "yes." 6 wonderful years and 2 amazing sons later, we're still just as madly in love and "there's no place like home." 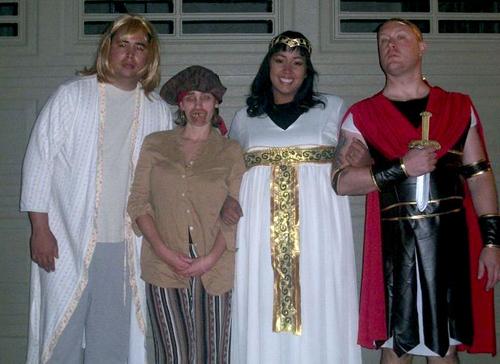 Linsey Knerl: My husband is an over-achiever when it comes to costumes. The night before the big parade for the kids, he tells me that he is definitely going with the "Wizard of Oz" theme for our boys. He stayed up all night, carefully wrapping cardboard with aluminum foil and creating a hat for our oldest son — the tin man. The two other boys were sort of an afterthought: one would be a lion from a costume we bought for dress up last year, and the other would get by with straw hot-glued to the inside of his clothes and hat. 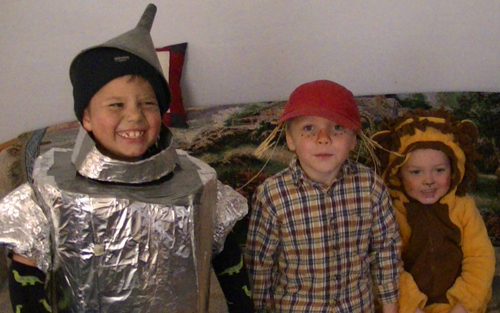 We were still assembling the tin man outfit as we pulled into the driveway of the spot where the parade was to begin. The kids were already lined up and marching down the sidewalk, and we were fiddling with zip ties and more aluminum foil! Even though our son lost the bottom half of his tin man costume within the first 2 blocks of the event, he was perhaps the best-dressed this year. And the only thing we purchased was the funnel he wore on his head ($1 at the thrift store). Even his ax was a homemade invention from duct tape and cardboard! 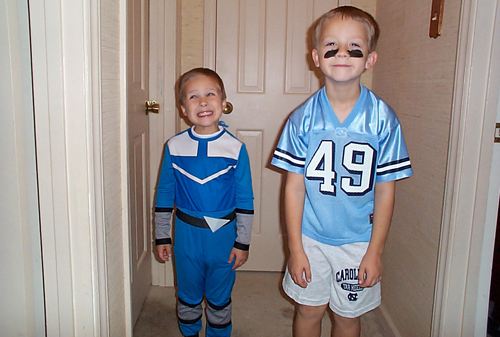 Julie Rains: The kids didn't dress up for Halloween this year (the picture above is from a previous Halloween). They have decided they are too big (16 and 13, both about 5' 7"). Their church youth group had a Halloween-oriented scavenger hunt, and then we stayed home and gave out candy to the few trick-or-treaters who stopped by. The most entertaining thing that happened was that my youngest son heard on The History Channel that 90% of adults eat their kids' Halloween treats. The most popular item is chocolate bars and the least popular is licorice. He seemed shocked that parents could be so sneaky. Then he confronted me about my past and I admitted to eating some of his stash from Halloweens long ago. My rationale was to help him avoid eating so much sugar. Paul Michael: I dressed as a Roman soldier, complete with SPQR tattoo. My wife was Cleopatra, and to stay with the theme, our girls decided to completely ignore it and be a witch and her cat! 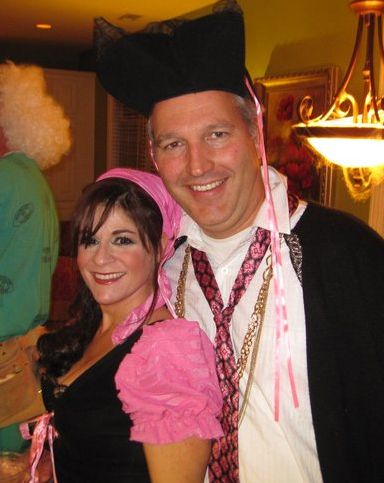 My brother-in-law was "sick housewife" and his wife was a pirate. Much fun was had by all, even though it was very cold here in Colorado when we went trick or treating on Sunday night. Lela Davidson: My husband and I knew we'd be pirates again this year, mostly because we already had the costumes. Sort of. Throughout the busy pre-Halloween week I knew that my husband's costume might be incomplete. At the edges of my memory there was something about using the pirate shirt as a buffing cloth, the kids mutilating the Captain Jack wig, and someone using the eye patch as a sling shot. However, I didn't have time to confirm any of that. We'd pull something together, I knew it. Come Friday night the only male pirate items in the house were the fake swash-buckling boots. I had to think fast. My husband ended up in a cape, my pirate hat (complete with pink ribbons), some cheap gold bling, and a fuschia tie. He was a rather flamboyant pirate. "Could you humiliate me any further?" he asked as we rang the doorbell to the party. Ten minutes later a friend yells to me at the makeshift bar, "Hey, Lela, you've got to see this." In the living room he posed with two cigarette-smoking pregnant women, one of whom was a nun. Clearly I could give tips for frugal Halloween costumes, but perhaps I should write a post for Parenting Squad about the messages such costumes send our kids!